Quark is a map primarily intended for duels & 2v2tdm, but available for a lot of other game modes. Thanks a lot for the constructive feedback during beta stage! Is there a reason for 2 x 50 armours, instead of putting a 100armour in it? I'm not a fan of maps with 2 x 50armours. (10-26-2016, 12:43 PM)kojn^ Wrote: Is there a reason for 2 x 50 armours, instead of putting a 100armour in it? With the balance I had in mind, 1 MH + 2 x 50a seemed appropriate though. It works on other maps such as Fuse or Imprisoned. my first impression, that elevator seems redundant, no major items around to risk using it. If you compare it to Warfare, there's 50a at one end, and rocket launcher on top. On your map, i don't see any reason to use it tbh. - Reduced some walls and windows thickness, so the map looks less "fat"
Thanks everyone for your feedback ! Enough with the betas now, time to work on details and textures. can't wait until the map gets some colors. I'm glad you're taking another go at a duel map. Comparing to your last duel map the scale seems more down to earth, it's not exaggerated like Cucumber, Mint and Silentsiege are for example. I like some of the choke point ideas this map has and I'm glad you're taking on the 2x50 armor scheme, it's very underrated resource scheme. I also however got some critique as usual and you can take it however you want. It's obvious that you want the map to be easily maneuverable, but I think you're opening up options for more circumstances than is necessary, which I see as shallow level design. All of the top duel maps challenge players with hard decisions, dictated by restrictive geometry and routes. 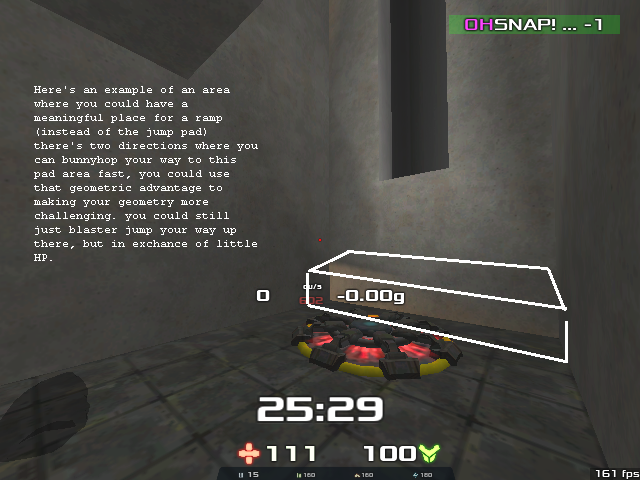 You also need to remember that Xonotic has blaster jumps, which essentially makes every place accessible by default assuming you have more than 25hp. So you need to understand what that means in vertical accessibility and vertical design. Is that block necessary? Is crossing over that gap in general a desired feature? If you want crossing over that gap to be a natural thing then make a bridge. If however you want to reward people with jumping skills, to enable them that special privilege then this block doesn't do it justice. If literally anyone who can use space bar can do the jump, then there might as well just be a bridge. This setup is just annoyingly and pointlessly easy. "opening up options for more circumstances than is necessary"
Not everyone could obviously do this jump the first time they jump the map, but people live to learn! 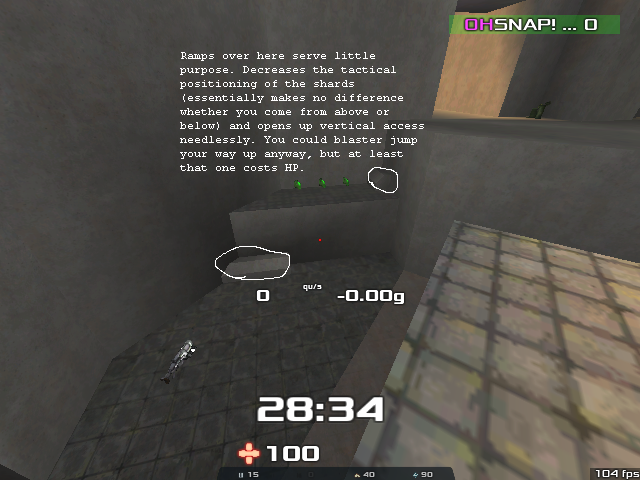 What Xonotic maps tends to lack is acknowledging the existence of blaster and the movement options it gives. Thanks for the tips, Smilecythe. I removed some of the blocks you mentioned. I won't make any other beta, though, and texturing takes a lot of time... But I'll post here when a new release is ready! Hey Spike, shall I wait for a new beta before doing a walkthrough video of this? Alternatively I can just use beta 4. I updated the first post with a new release, Quark_v1. 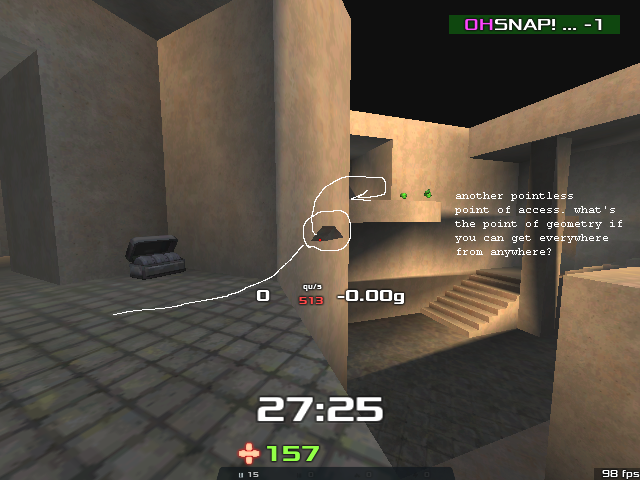 The map now has proper textures and environments details, bot waypoints, etc. There are also 2 easter eggs in this map... will you find them? I'm excited! I'll check this out ASAP. It's not the kind of map I like the most, but it is a great map, Spike, and great work, of course. Oh, and I like A LOT the detail of a crashed satellite embedded in the outside wall. Very original, very nice. Thanks Julius, I'm glad that you noticed the crashed Sputnik! - Removed Hagar and moved Crylink to its location. - Rearranged shards and ammo items a bit. - One door was too thick, reduced its thickness to 64qu. The download link is on the first post. Enlarged the Devastator room a little, it was too cramped. More map details (pipes, lights, etc.). Brush cleanup (better hint brushes, removed useless clips, etc.). Download link and screenshots in the first post, enjoy! Played some matches on this map the other day and was immediately surprised about the quality of this one. Should be part of 'official' vanilla xonotic, it's really good imo. The download link and the screenshots were updated in the first post. Added a ramp jump in the Mortar room. Improved the hint brushes (again) + minor brush cleanups. Fixed a few misaligned textures. This is probably the last version of the map. There is a known issue that I didn't manage to fix, but it's not a big deal (thanks Halogene and Mirio for pointing it out). You can stand in the void if you stay very close to the curvy part of the upper platform in the main room (above MH). It's not easy to do it though, even on purpose. Yet another map release, Quark_v4. Raised the door facing the top teleporter exit and the door in the crylink room, since players bumped on the wall at high speed. Refactored the crylink room a bit, added a ramp jump. Raised the ceiling a bit in the lower corridor. Added a pipe under the small platform with 3 shards, usable as a ramp jump. Better bot waypoints, provided by Terencehill. Use new weapon entities names: nex -> vortex, rocketlauncher -> devastator, etc. Minor brush and texture cleanups + minor additional details. It's still possible to bump on the wall after the top teleporter exit, it just won't happen as often as before. Hosted in BuddyFriendGuy Fun Server.